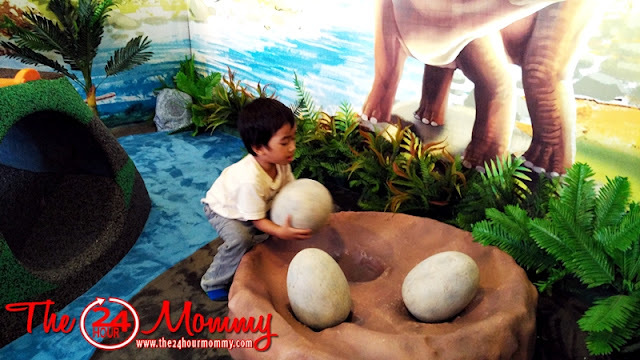 The 24-Hour Mommy: The Mind Museum's Dino Play now open for a limited time only! 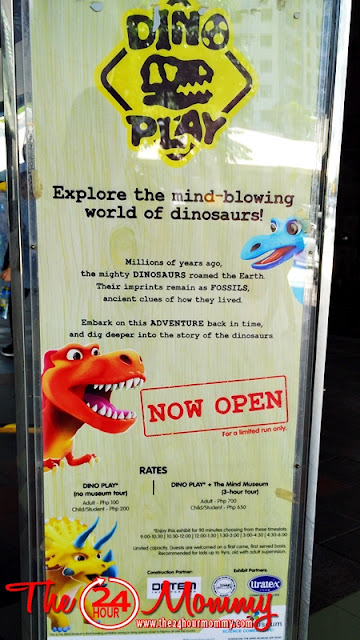 The Mind Museum's Dino Play now open for a limited time only! 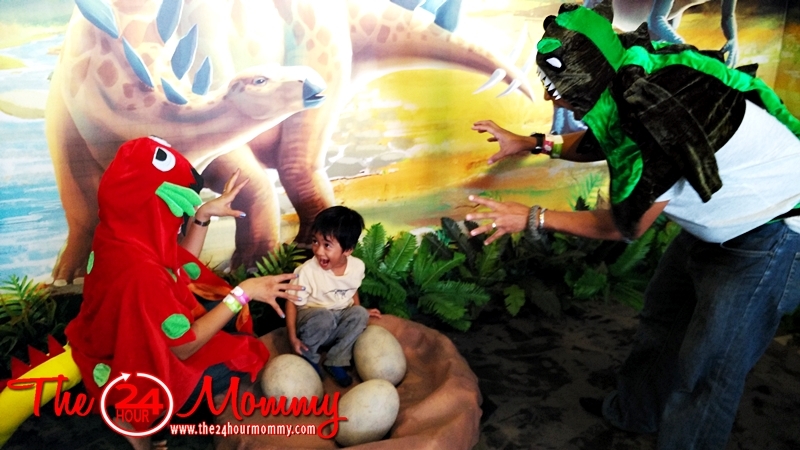 Have you ever wondered about the appeal of dinosaurs on kids, especially on young boys? 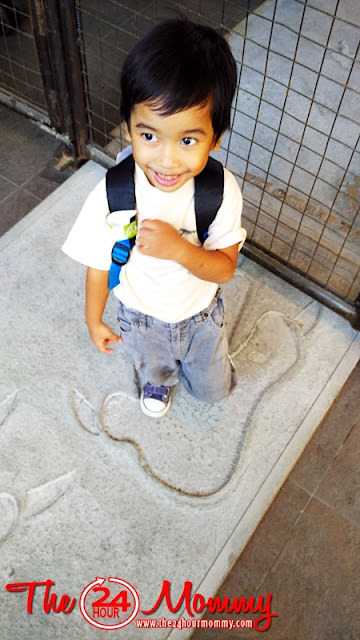 I mean, my son had this dino fanboy stage and now, my 3-year old nephew is in that same phase. Leland Dinosaur, as we fondly call him, loves everything dinosaur. He plays with dino models, he reads dino stuff, and watches dino shows, too. So when I was invited to visit The Mind Museum's newest outdoor interactive exhibit, Dino Play, I immediately said yes and had my brother and sister-in-law come with Leland Dinosaur and me. We started our visit with a quick walk around the perimeter of Dino Play. We were greeted by this cute baby dinosaur just outside the door. Leland was immediately drawn to it and wanted to play with it right away. 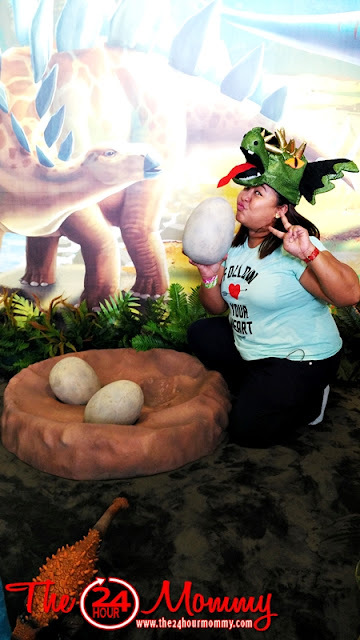 It's good that even kids outside Dino Play can have their photos take with it..
We also got to read fun facts about dinos that were posted on outside walls of Dino Play. 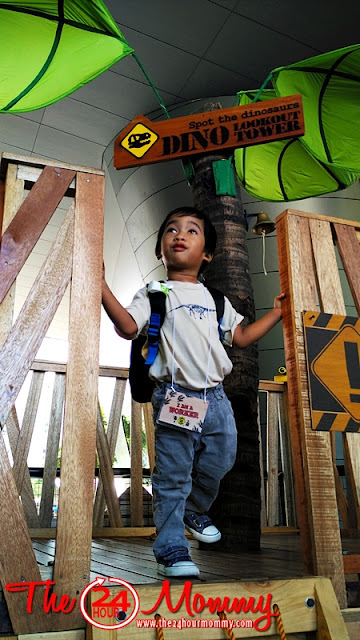 After that quick tour, our Dino Play adventure officially began. Here you can see how small Leland is compared to the footprints of a Tyrannosaurus rex. 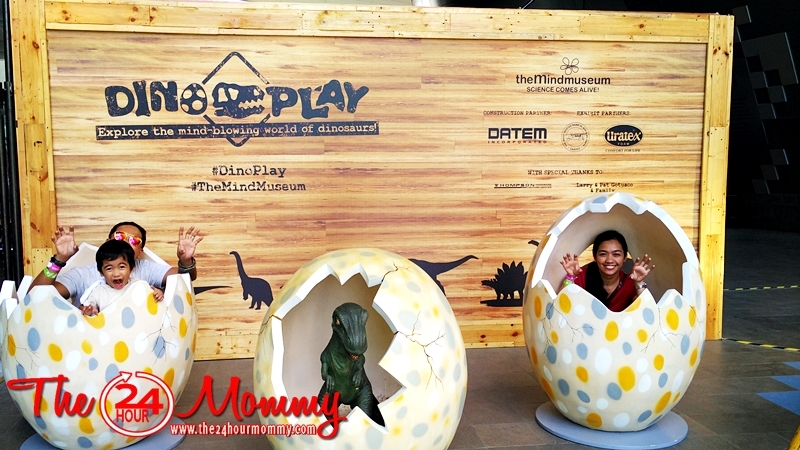 Dino Play is divided into four nests. 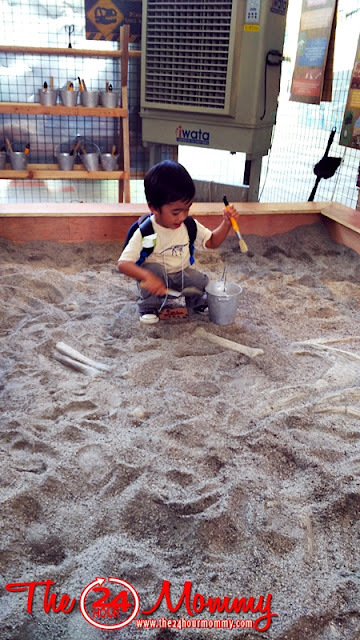 We began with the first nest, Dino Dig. 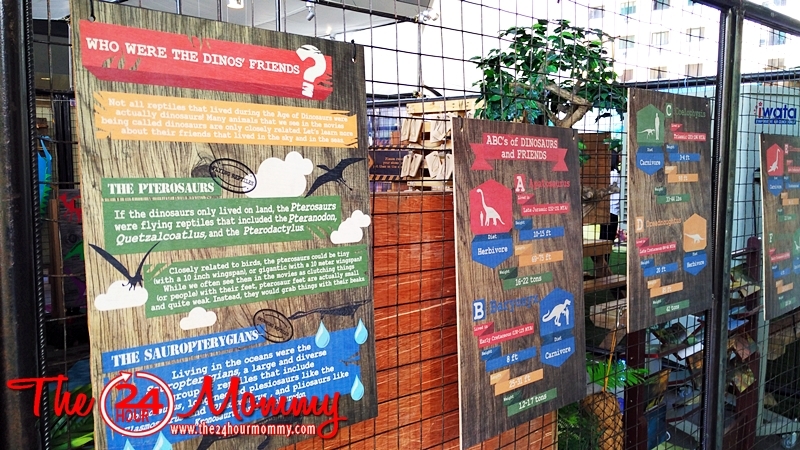 Launched last June 29, Dino Play encourages young dinosaur fans to experience and explore the world of dinosaurs. 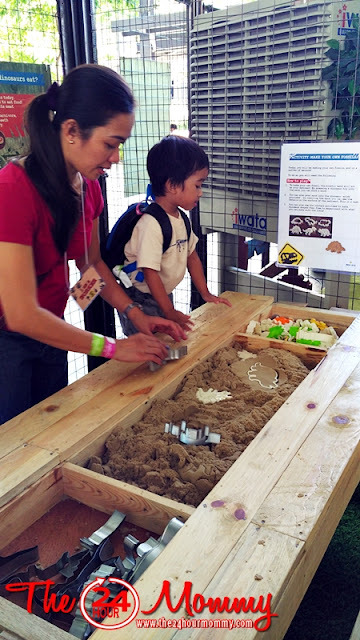 Everything that is inside the exhibit can be touched and played with. Leland had the perfect excuse to get dirty, haha! There he is having a grand time digging around. He didn't even want us to help him find the dinosaur fossil he was looking for, not even his Papa. So while waiting for Leland to finish pretending to be a paleontologist, we read the Dino Dig Adult Guide. 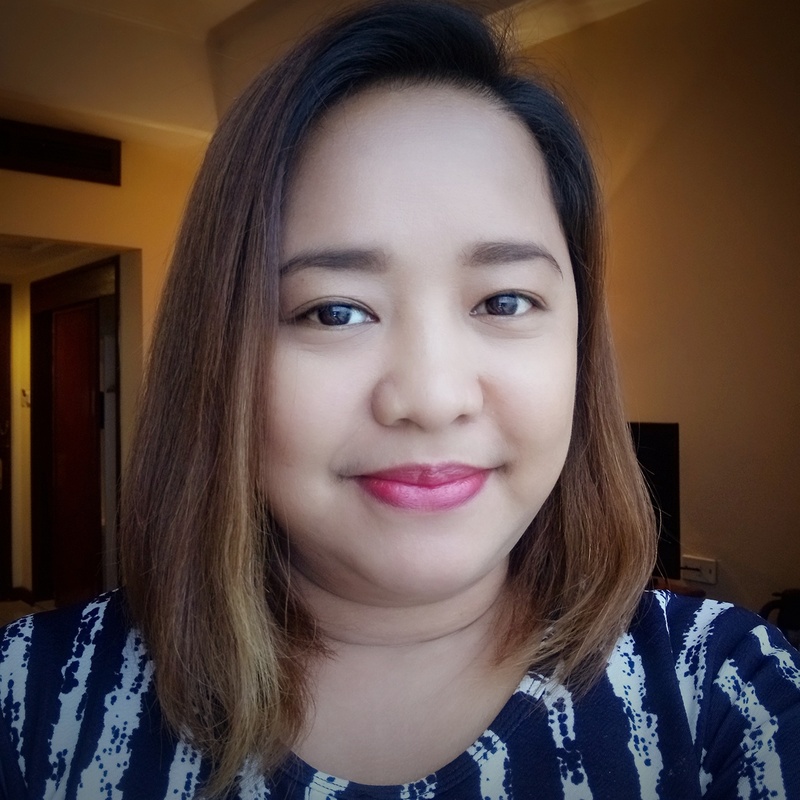 Each nest has an Adult Guide book so parents and teachers get to know supplementary information that they can use to further enhance their children's or students' learning experience. From this nest, Leland Dinosaur ran all the way to the opposite nest which is the Dino Fun area. He quickly climbed to the top of the Dino Lookout Tower and peeked into the binoculars trying to spot a rogue dinosaur. His shirt also had a dino print on it. That's how addicted he is to dinos! Under the tower is also an activity area with lots of dino models. Nope, you can't take that home! LOL! Then, we settled on one of the activity tables in the nest. 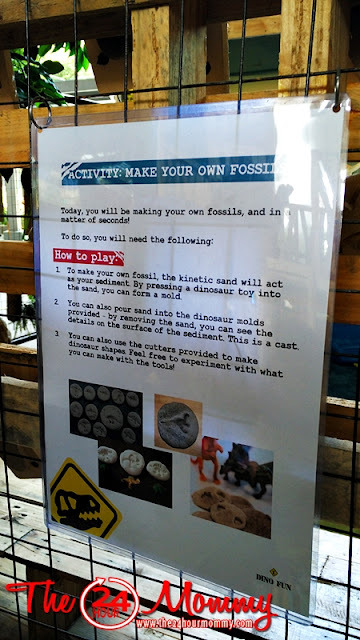 Leland and us, adults, had fun molding our own dino fossils with the kinetic sand and molds. 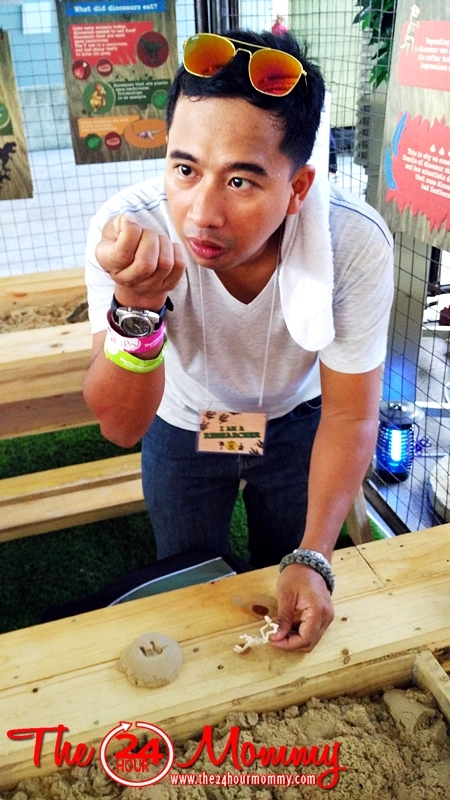 Hay naku, my brother was the one who was so amazed with it! Hahaha! Wala sa bundok niyo niyan? My gosh, I know what to give this guy on Christmas! Hahaha! Leland Dinosaur was aching to run around and get wild so we headed to the next nest, the Dino Den. 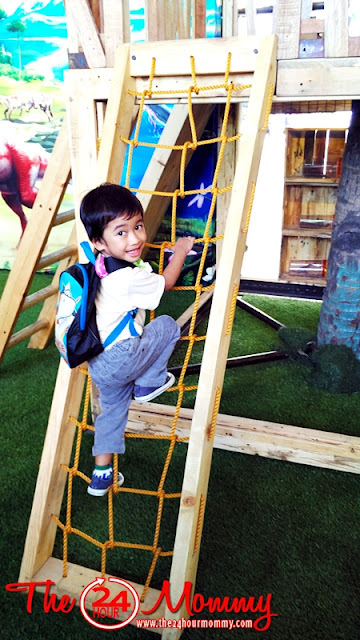 This nest is actually recommended for younger kids like him because it is a play area set up with a forest land theme. 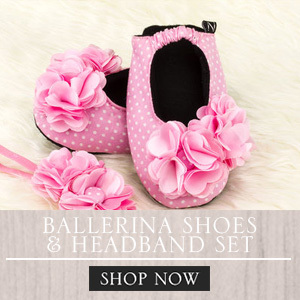 Kids can put on dinosaur costumes and dinosaur feet (flip-flops) and stomp on the padded floor just like how dinosaurs walked the earth trillion of years ago. Leland had other plans, though. 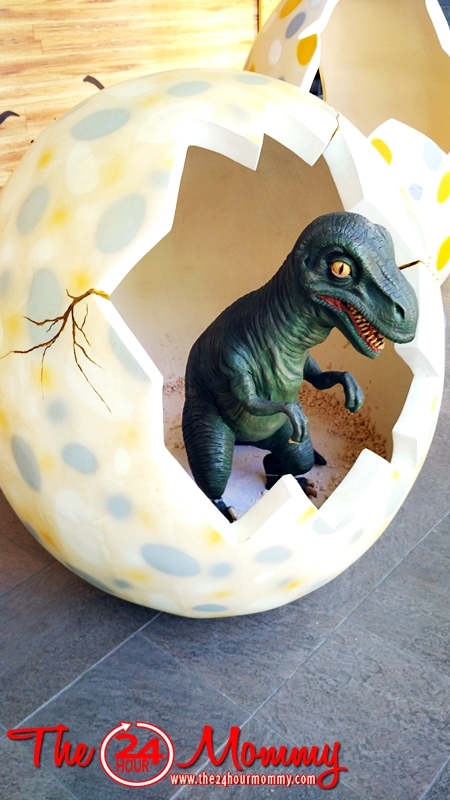 He didn't want to wear a costume and just wanted to take care of his dino eggs. So the bigger dinosaurs had all the fun! 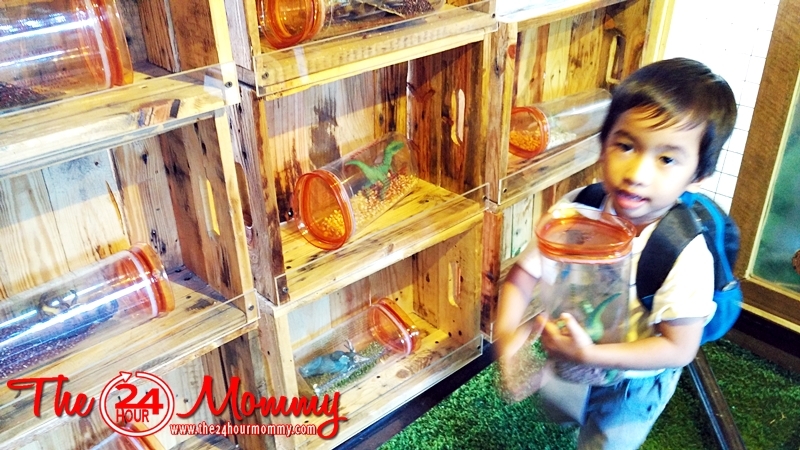 Pretend play is a good parent-child bonding activity. And finally, we went to the Dino Lab nest to examine fossil remains. Armed with a magnifying glass, we investigated dinosaur bones, petrified wood, and even dinosaur poop that has since turned to stone! We stayed for about two hours inside Dino Play before we headed outside to transfer to The Mind Museum. 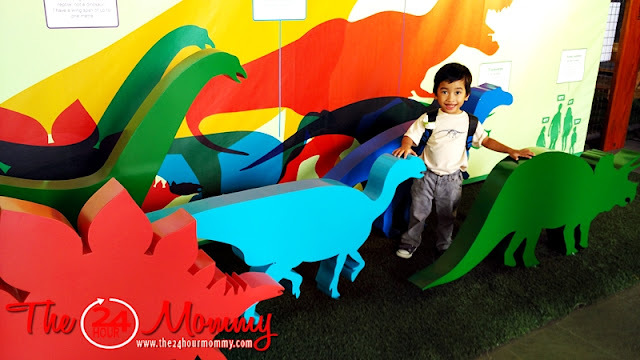 Leland Dinosaur said goodbye to his dino dabarkads and had his souvenir photo taken with his Papa, Mama, and baby dino friend. 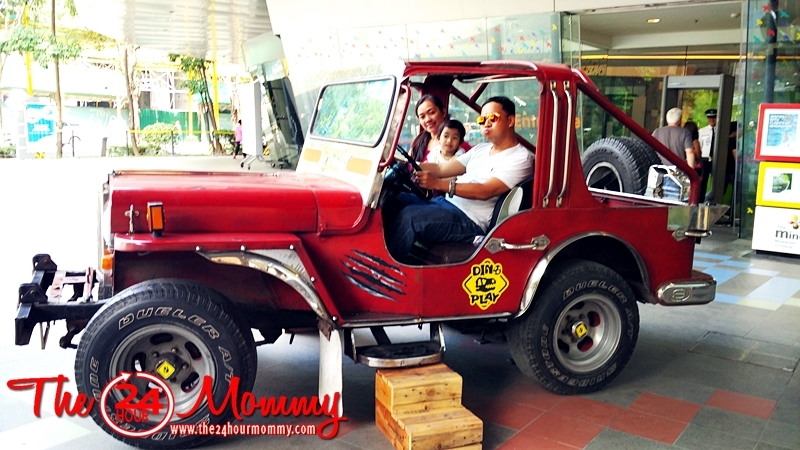 And to complete the adventure, they "rode" the Sarao Motors jeep that will take them to their next exploration! 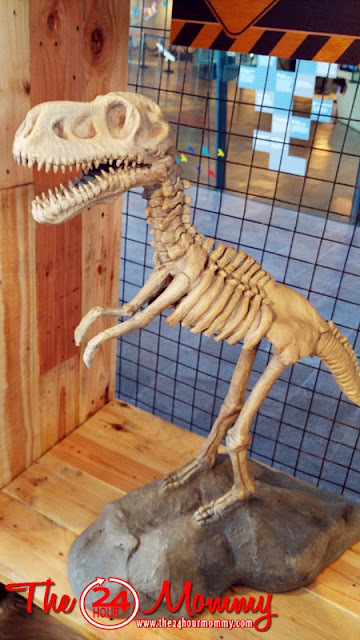 If you have a kid who's as fascinated in dinosaurs as our Leland Dinosaur, why not satisfy their curiosity (and yours) by scheduling a visit now. 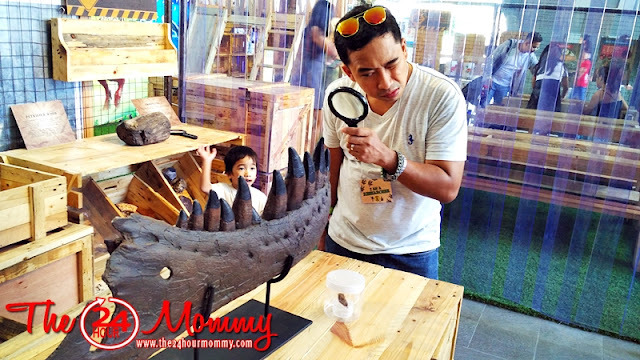 Dino Play will be on display until September 30, 2016 only as it aims to travel to cities and provinces around the country as part of The Mind Museym's mission to bring science closer to the general public. Dino Play is recommended for kids aged 9 and below and with adult supervision. You can visit www.themindmuseum.org to book your tickets and to get more information about this awesome travelling exhibition. Wow! So great that the Mind Museum creates limited edition galleries. THis one is really great for the kids. I've been inside the Museum, but they continue to surprise their audience. 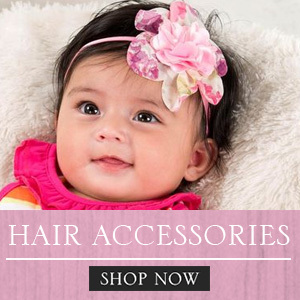 Okay, this is SERIOUSLY cute! 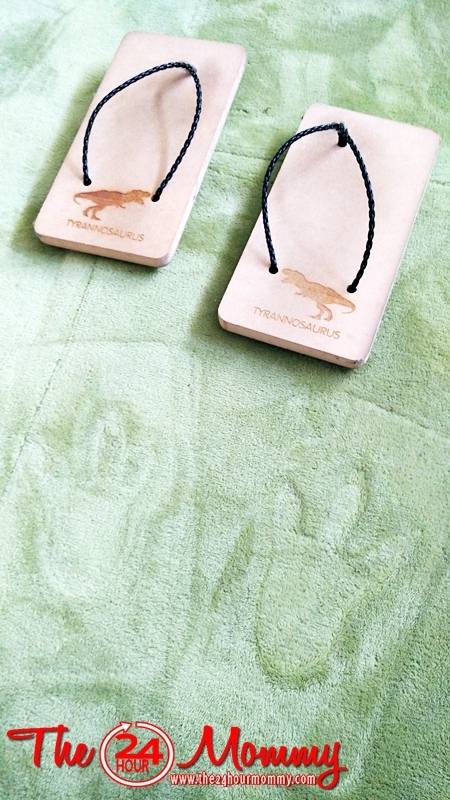 Love the little shoes that leave dinosaur prints behind. This looks like such a fun place to bring kids! That's an awesome park and you kid seems to have had a lot of fun. Who wasn't obsessed with dinosaurs when they were little? I know I was. I would have liked to visit such a playground back then. My son would so totally love this place! Ugh! If only Manila was a 30minute drive away, we'd be there in a heart beat! That's really awesome! Kids are so fascinated with dinosaurs and it would be nice to take them to a place where they can learn more about dinosaurs. I love the activities as well, definitely worth going to! It is such a nice thing seeing moms like you really take time to bring their kids out and do activities beyond ipads and cellphones. 2 of my nephews are also into Dinosaurs and have a weird fascination towards them too, I just might bring them here! :) Thanks for sharing this! I want to go to mind museum too, I want my son to see and explore there. I'm not a kid anymore but the urge is strong to go there and play! Tanks for sharing! I am currently watching a variety show entitled Superman is back. There are Korean triplets there and one of them, Minguk loves dinosaur so much. 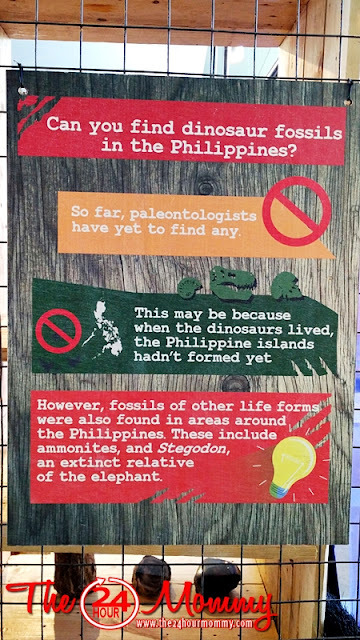 It's amazing how a 4-yr old know a lot about dinosaurs. I remembered him when I saw this post. I'm pretty sure the children enjoyed it there. Now that's something new there! I've heard of Mind Museum lots of times and this new addition is much more addictive because I. Love. Dinosaurs! Too bad I'm already old enough for this. Haha! Wow! I think a lot of kids will definitely enjoy this museum!! I wanna go here hihi. Great post dear! 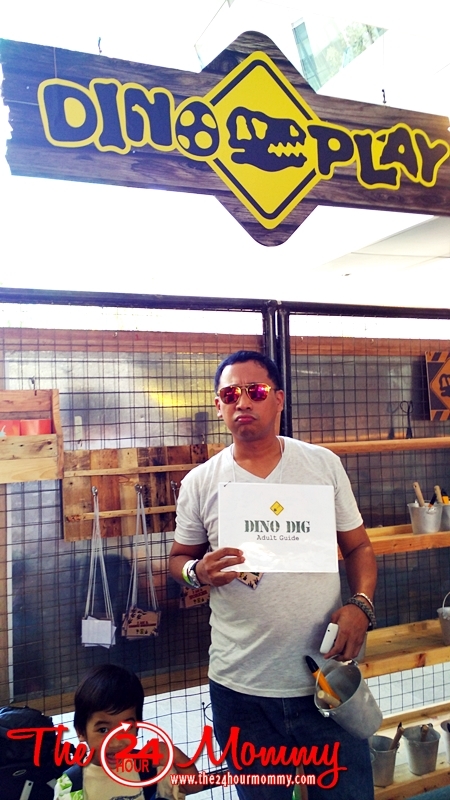 I want to take my son to Dino Place on his birthday. Where about this place?